Unit 26: Our future on Mars? Open unit selectorClose unit selectorUnit 26 Our future on Mars? Do you fancy life on Mars? 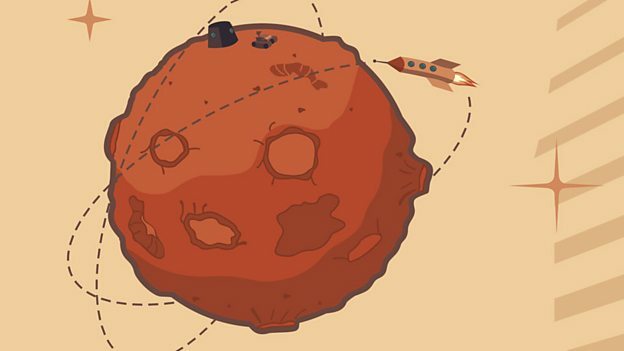 Read about a plan to start a human colony on the red planet, and practise the future perfect tense! Read the article. As you read, try to answer this question: When will the first humans arrive on Mars? How would you feel about living out the rest of your life on the planet Mars? After all, it's a mere 140 million miles away and has lots of beautiful red dust to enjoy. What's more, scientists' recent discovery of running water there means you wouldn't even have to go thirsty. So, you're tempted? The thing is, if you fancy a future on the red planet, you're not alone. When the Mars One project asked for volunteers to make a one-way trip with them, over 200,000 people applied. Mars One? It's an organisation with the goal of creating a "permanent human settlement" on Mars. The Dutch not-for-profit body believes that establishing a colony on the planet is the "next giant leap for mankind", and that it will help us understand the solar system and inspire generations to come. Their ambitious project has attracted both worldwide attention and heavy criticism. Scientists have questioned the technical feasibility and large questions remain about the ethics and funding of the project. But Mars One are adamant they can overcome all the obstacles in their way. So, what about those 200,000 applicants? Well, that number has now been whittled down to 100, and this in turn will be reduced to 24 after a stringent selection process. This will involve filmed interviews, group activities and a survival challenge in a mocked-up Martian environment, before successful candidates train for the mission itself. By 2016 they will have selected final crew and training for the mission can begin. Mars One says this will not only test the group's ability to "deal with prolonged periods of time in a remote location" but also it will teach them medical procedures and enable them to grow their own food. Between 2020-2025, unmanned spacecraft will land on Mars and prepare a base for the human crew. A rover will scout the planet for a suitable home. And life support units will create an atmosphere suitable for life. By the time the first crew set off, this technology "will have produced a breathable atmosphere of 0.7 bar pressure, 3000 litres of water, and 240 kg of oxygen." This first group of 12 astronauts will themselves have completed training by 2026, and will make the journey to Mars that year, landing in 2027. A second group of 12 is scheduled to depart in 2028. Time will tell if the project will be a success. But for R. Daniel Golden and Yari Rodriguez, a trip to Mars might even be a romantic destination. In an interview with American broadcaster WGBH, the couple revealed that they had both been selected among the final 100 applicants, and they hoped they could make the cut and continue their life together as astronauts on Mars. If that happens, could we even see the first ever 'Martian' baby? Answer: The first humans will arrive on Mars in 2027, if the project goes to plan. Now, try to answer these questions which test your understanding of the article and of this unit's grammar. Please take another look at Part Four. What will have happened by 2016? When will the planet be ready for humans? Check the vocabulary definitions if you need to. Which word means 'lasting forever'? Look at Part Three and the vocabulary definitions again. What is a "mocked-up Martian environment"? How many astronauts do they expect will have reached Mars by 2026? Have a look at Part Three - the key is the word 'feasible'. Why are some scientists not convinced by the project, according to the article? What does 'Martian' mean here? We hope you enjoyed reading about this project. Do you think it could be successful? And would you like to visit Mars? In Session 4 we continue to practise the future perfect tense - by going out onto the streets of London and asking people about their future plans. Hear some authentic English and improve your grammar! I'll have done it by then. I won't have finished by then. Will you have read all the reports by the end of the day?